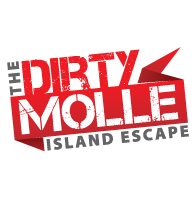 Rest assured The Dirty Molle Island Escape is shaping up to be another great adventure! Tickets will go on sale soon, join our mailing list and you’ll be the first to know! While you’re waiting check out the updated information on our website, join our Facebook page where we have great photos of the last two years’ events & check out our video and make sure you share it with your friends. You won’t need to twist their arm any further. Video thanks to JJ Pictures! Posted on April 24, 2015, in Uncategorized. Bookmark the permalink. Comments Off on The Dirty Molle is coming….